As we retreat indoors this winter, more and more people are looking to their indoor spaces for comfort, warmth and a place to simply “be”. The question of “What is a luxury bath?” is described perfectly in this Waterworks blog “The Perfect Bath”. “Luxury is never about how much money is spent. It is about the wise and comfortable use of proportion and scale, meticulous installation, well-articulated architectural details, functionality and the accessories used to personalize the bath. And, it doesn’t matter if the space is large or small. The important factors are: clean and classic lines, quality materials, artisanal craftsmanship, elegant and nuanced surfaces, and outstanding functionality”. Shower System: Whether it is a steam shower, large rain shower head, dual shower heads, hand held showers or body sprays, these are a must with the increasing popularity of large showers. Tub: Not all of us want them, but for those of you that do, there are amazing tubs available with chromatherapy, aromatherapy, thermotherapy and hydro-thermal massage. Also popular are architectural freestanding tubs that add a design element like no other. Heated Floors: Bring a bit of the spa home with you. There is nothing like a heated floor especially in the damp Pacific Northwest. We recommend Nu-Heat and Warm Wire to our clients. These can just be installed in front of a vanity or shower so you can still experience heated floors without breaking the bank. When designing and remodeling your bathroom it is important that you keep you personal style and needs in mind, since it is the most private space in your home. You want it to be a space that is not only comfortable, but functional. As a bathroom designer, I can help with all of your design needs to create your dream bathroom that will be classic and durable. Contact Mosaik Design & Remodeling for a bathroom remodeling appointment today. That’s really cool! Is it a window behind, or just open to the outside? I believe it is a window looking out to a stone wall. This was the picture posted on the Waterworks blog and I just loved it! Good tip about installing a heated floor in a small portion of your bathroom. I think sometimes we fall into this ‘all-or-nothing’ mentality when just improving a portion of something can have dramatic results. You are absolutely correct. Sometimes the small things can be the big things! I also had the same question about the background image. Interesting. I like the use of muted colors in the photo with the eye being drawn to the green; the plant breathing life into the space. Right! 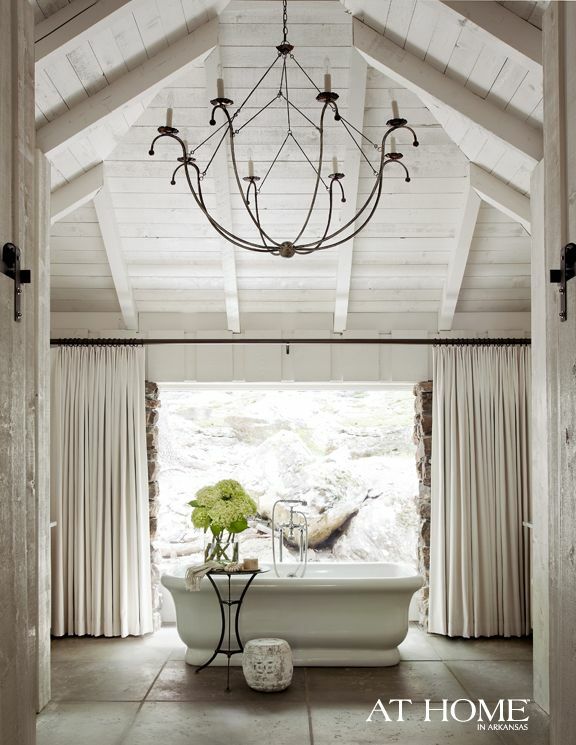 Stunning photo and bathroom–wish it was mine! I like Luxurious Bathrooms because these bathrooms are more comfortable then others. I totally agree with the idea that your bathroom should be an oasis. These days how many truly private and relaxing places do we have available in our busy and overstimulating lives. Why not make your bathroom a beautiful place for meditation and relaxation.